Avascular necrosis of the femoral head occurs when the blood supply to the femoral head (A) is compromised. 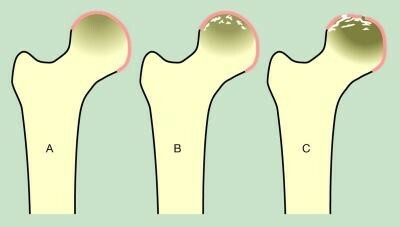 As a result the bone dies (B) and it loses its support structure for the cartilage and the femoral head collapses (C). There are several causes that could lead to this condition. The main traumatic causes are hip dislocation and fractures within the hip capsule. In addition, long-term use of high doses of cortisone as part of treatment for asthma, rheumatoid arthritis and other disorders poses a risk. This condition usually appears between the age of 40 and 60 years. The most common complaint is initially pain in the groin, followed by increasingly limited mobility. The diagnosis is made after clinical examination, X-rays and often includes an MR scan. The duration of the condition varies from several months to over a year. In the initial stage avascular necrosis is treated conservatively with pain medication and unburdening the joint by using crutches. The objective is to prevent the femoral head collapsing and the associated damage to the cartilage. Once the femoral head has collapsed the most successful treatment involves performing a total hip replacement.